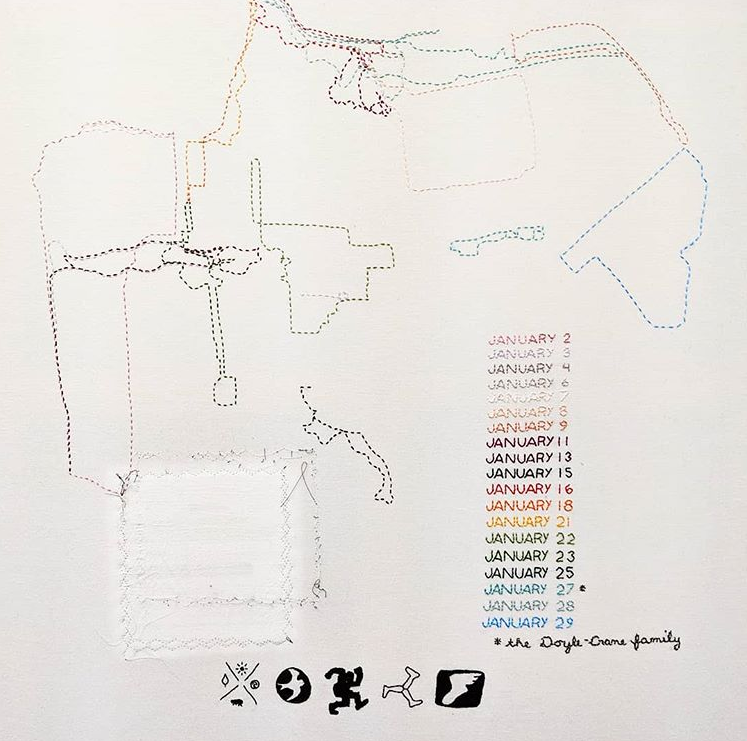 Margaret Timbrell is a text-based needlework artist working in the Bay Area. Her work, inspired by technology, parenthood, and social media, alters our language and interpersonal engagement. Margaret has exhibited several times at stARTup. Last year in San Francisco, at the entrance of the Del Sol, she installed a blue velvet curtain filled with beautiful hand-stitched names which were inspired by iPhone auto-corrected name fails. The wall created a backdrop for selfie-taking and sharing for our fairgoers, and it drew attention to the subtleties of social bias and the ways the tech sector erases the identity of its consumers. As we continue our stARTup Success Stories series, and with artist applications open for Small Works 2019, we look at Margaret’s small works that have generated a big impact. 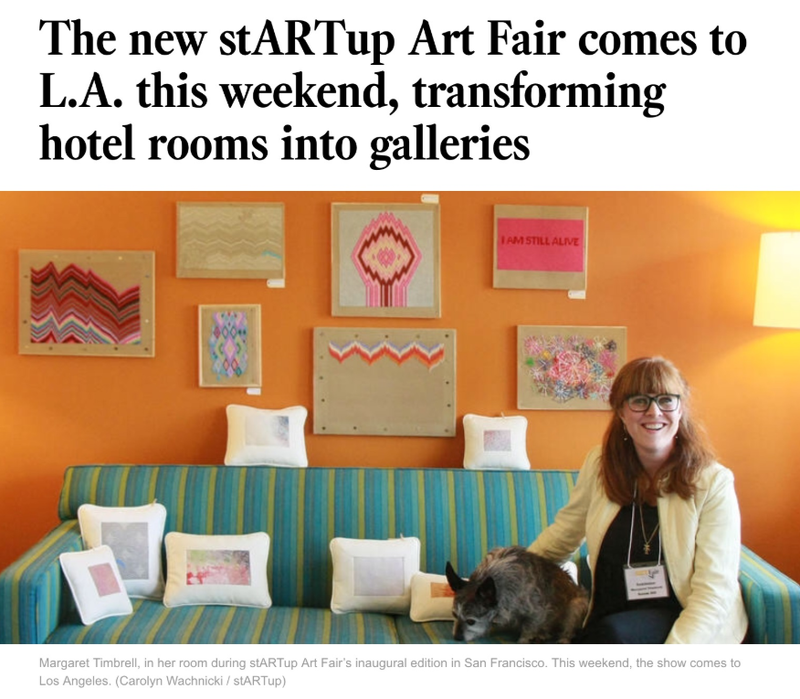 And as we moved to Los Angeles in 2016 for our inaugural edition at Hollywood's Highland Gardens Hotel, Margaret’s room was featured as a preview for what Los Angeles Times readers could expect from the new fair in town. Margaret’s quirky, conceptual, and easily approachable works were the perfect fit to describe stARTup Art Fair, a “scrappy, year-old enterprise out of San Francisco” focusing on emerging artists, many without formal gallery representation — including Margaret. Capitalizing on this momentum, 2017 became a standout year for her as she secured two solo exhibitions at the Pacific Felt Factory for “Autocorrected,” as exhibited above with stARTup, and a newer body of work “RedWork,” named after redwork embroidery. Margaret is in the process of soliciting corporate sponsor and individual sponsors. She currently has seven sponsors: Destination Racing, Sasquatch Racing, Run Club SF, Oiselle, Bare Republic, Wine Country Half, and Doyle Crane. We’ll continue to cheer her on as she runs toward her 2019 goal! Read our other success stories by our Content Curator from the beginning: Success Stories: Chapter 1, with Andi Campognone, Curator and Director, or our most recent with Rodney King.